BudgetLightForum.com | ...where Frugal meets with Flashlight! 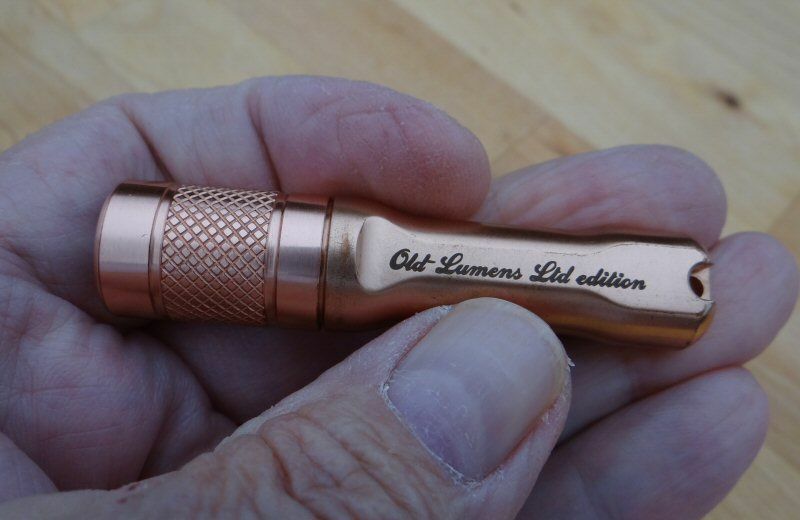 The 6th Annual BLF / Old Lumens Scratch Made Light Contest - People's Choice Award - Please vote! Read more about The 6th Annual BLF / Old Lumens Scratch Made Light Contest - People's Choice Award - Please vote! 2nd. Annual BLF Scratch Made Light Contest is CLOSED - WINNERS results have been posted in the OP! Well, the moment is upon us! I will be contacting all of you over the course of the next several days, to let you know how to redeem your prizes. With the holiday, I think it will be sometime next week, before I hear back from all of the dealers involved, so please be patient. I just want to thank all of you who took the plunge and made build threads here. They have been the highlight of my days for quite some time and I appreciate all of the labor and thought put into them. You are ALL WINNERS in my book!! Thanks also, to the judges and to all of the sponsors. Last, but not least is the members here who helped support the contestants during their builds. Read more about 2nd. Annual BLF Scratch Made Light Contest is CLOSED - WINNERS results have been posted in the OP! At least for the time being, threads discussing CPF moderation issues and policies will be considered a controversial and divisive subject. I have taken the three main problem threads offline. My intention is not to quell freedom of speech, but rather to extinguish the flames that have been raging here, which have resulted in hurt feelings, insults, and arguments between users that are normally a lot more amicable. These heated discussions haven’t achieved anything productive or enjoyable, and additionally have created a moderation nightmare for me. My apologies to any who were offended in the arguments, and sorry for not stepping in sooner to put an end to the fighting. The Contest is Done! I will have the winners results in a few days. Once the judges all contact me, I will tabulate the results and let you all know. Rufusbduck is also the Overall Contest Winner. Best in Contest! There's more - I can't tell you how hard it was for the judges to choose winners, so for the rest of you guys? You are all winners and it was so close that you need to be rewarded too. Contestants - I will PM you in a day or two and let you know how to redeem your prizes. I sincerely want to thank the contestants for making their builds. I know sometimes it's hard to reach out and try something new and also it can be hard to be in the limelight sometimes, for risk of failure. None of you failed. You all exceeded any expectations with the fabulous builds and the great threads you made. I am deeply indebted to you all for making this such a great contest! To the sponsors, (both BLF members and sellers), I thank you for giving me the ability to give prizes out to our contestants. The the rest of the forum, I thank you for supporting our contestants during the competition. I think that about sums up how I feel. Contest Entry – Sign up here, to enter the contest. When you post that you want to enter, make sure you state if you are entering in the Machine Made category or the Hand Made category. You can enter only one of the two. Entries will be accepted until 06/08/2013 at Midnight UTC. EDITED 6/7/13: The Contest begins on Midnight UTC 06/08/2013 and runs until Midnight UTC 06/30/2013 07/15/2013 (hope that helps). Do not start your build before the contest starts. Here is a World Map of Time Zones showing the current time, with UTC time at the bottom of the chart. Here is a UTC converter, which may help. Contest rules are described below. (This is an honors system contest, please honor the rules so we can all have a fun and honest contest). The above battery cannot be used anymore, it will short and might explode. The wrapping will sometimes break, luckily it is a fairly simple operation to fix it. Please do NOT respond to them in any way, either publicly or by private message. Please DO contact me immediately. It's that simple. Trolls do what they do because they are immature and like to get a reaction out of people. They will never change their ways if somebody with good intentions tries to counsel them. And they will get even worse if other users fight with them or insult them back. So, please try to use self control, and do not respond in any way, shape, or form. Additionally, I will no longer make public posts about the banning of trolls, because even such negative publicity is enough to encourage them to try harder. But rest assured, the banning of trolls only occurs in rare and extreme cases, and there will be not be a sudden rash of secretive bans happening here on BLF. Thanks for reading! Have fun. Thanks for reading this message. These are not new instructions, but rather a simple reminder for all of our users, both new and old. In four words: Please avoid them completely. I'm sure that most of you have seen the results recently of discussing the highly controversial subject of gun control. I understand that when a tragedy happens, everyone wants to talk about it. In fact, a tragedy in and of itself wouldn't really be considered a controversial topic, since I'm sure that everyone here views it as a sad and undesirable event. The problem is when users switch from expressing sympathy to expressing controversial viewpoints about important issues in society or government. And yes, there are many important issues in this world, but as I always say, a flashlight forum is not the appropriate medium for discussing them, to say nothing of actually changing them. The recent arguments about gun control are a perfect example of this. Both opponents and proponents of the issue have to admit that the discussion that was generated here on BLF really did nothing to change things on the world scene, and only generated an unpleasant argument and hurt feelings. In view of this, if you have posted here on BLF about gun control or government policies or pros and cons of the gun policy in a certain country, please go back and edit the post to remove such comments. The poster politely introduces a relevant flashlight company or product in the "Commercial Sellers' Spot" category. If a user repeatedly violates other BLF rules aside from posting SPAM, such as being rude or discussing controversial topics, please contact me via private message, and I'll send a polite message to the user to remind him about the rules and ask him to change his ways. I've learned over the years here on BLF how to handle most issues in a way that doesn't make the user feel belittled or manipulated, so please don't try to handle non-SPAM issues with the SPAM button. Please remember that BLF is not Slashdot, and users are not to be marked down just because they have a different opinion or a weird personality. Thanks in advance to all of our users for reading and carefully following these instructions, which will help contribute to a peaceful and fun environment here on BLF. As you are all painfully aware, we've been under attack by spammers recently. First of all, my apologies for not taking measures sooner. For one thing, I was traveling for a few days and couldn't quickly intervene to delete the spammers and their posts. And secondly, I have been researching the available options for fighting spam. So, you want a flashlight with modes that are just right but can't find the one, no matter how hard you look? You are especially craving for a light that can be programmed with light levels ranging from hardly visible to full blast can't-see-anything-but-dark-spots-for-a-few-minutes when accidentally shone into your eyes? Onna stick In a P60-style host? Well, today's your lucky day. First, you will need to organize a few parts. 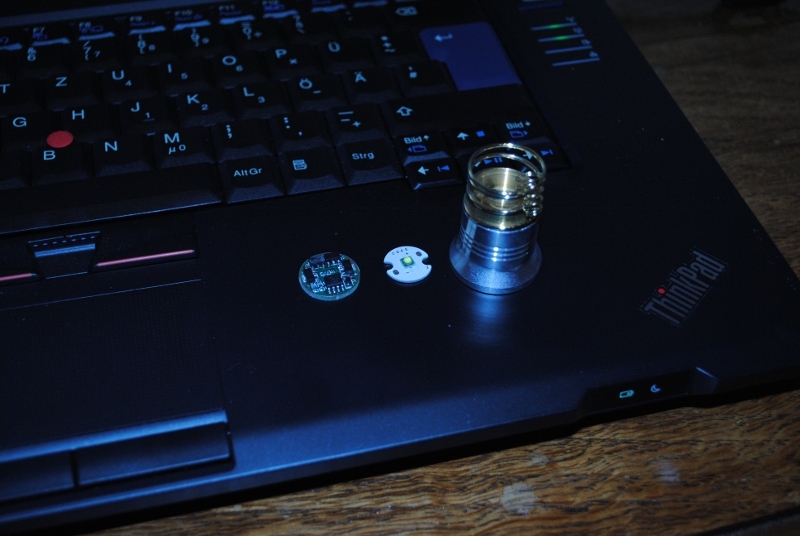 From left to right, the NANJG 101-AK pimped with a fourth AMC7135 (other µC-controlled driver PCBs might also work), an XP-G R5 and a P60-style reflector with brass pill from KD. Now with 100% all natural asbestos! Read more about Would you be interested in buying a Stainless Steel Bezel for the Astrolux FT03? Sorry, not ready yet. Poll closed, Not finished box design for Sofirn with highest possible sale in mind. Which would sell best? Any suggestions would be most welcome. Read more about Sorry, not ready yet. Poll closed, Not finished box design for Sofirn with highest possible sale in mind. Which would sell best? Any suggestions would be most welcome.